If you’d like to help Habitat build affordable homes by volunteering your professional services or by donating new building materials from your business, please email us at info@habitattucson.org so we can get in touch! Habitat for Humanity Tucson is a 501(c)3 nonprofit, each material donation is tax-deductible to the full extent of the law. During this one week high energy cause build Habitat Tucson relies on local builders to provide the materials, labor and time to construct four complete homes. 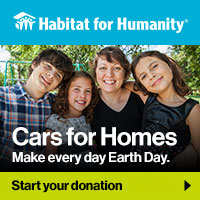 Please email us at info@habitattucson.org to learn more about becoming a partner for this high profile project. Drop off donations at the HabiStore or give us a call (520) 230-5323 to schedule a free pickup of items that are in good condition. We accept furniture, cabinets, appliances, lighting, building materials home decor, and more! All donations are tax-deductible and we offer free, easy pickup. For businesses, donating to the HabiStore is a great way to move discontinued or excess stock, deal with gently used returns, and show your customers that you care about the environment and your community. Plus, we’ll pick up your donated goods, which saves you time and money.